Twitter is not just for breakfast any more. Life scientists and companies are using it to learn and share information, and there are likely a few thousand life scientists and more than 100 related companies using it. One of the really great things about twitter is that you can find connections based on the content they are tweeting, and you don’t need to know them to follow and vice versa. Whether you’re in marketing or do research, the value lies in following a good quantity of high quality life scientists, and having them follow you back, and here are some tips and tricks for achieving this goal. David Bradley’s Scientist Twibe–600 scientists (perhaps not all life scientists). Follow these scientists, add yourself to this list, and browse sites like wefollow and follow people and add yourself to the appropriate list(s). Search Twitter for terms you’re interested (e.g., RNAi, epigenetics) and follow twitterers in search results. Some twitter applications like twhirl allow you to add searches to your stream, making it easy to follow as you go. Conference hashtags. Tweets from most life science conferences include a ‘hashtag’, e.g. #asmgm for the ASM General Meeting. Search for the hashtags and follow twitterers. Find a great life science twitterer and follow who they follow. Their list can be found on their profile page by clicking on the ‘following’ link. Don’t follow their followers, as these lists are usually a lot more noisier than the list they are following. Note: You shouldn’t follow more than 100 people a day, as Twitter may flag you as a spammer. Provide good content. Twitter is used to share news and information related to your interests, be they personal or professional. To get people to follow, you need to give people something interesting to look for. We’re big proponents of using RSS for this function, you can even set it up to send yourself a daily email of customized content from across the web. Of course, you can also promote yourself, as long as you follow our 90/10 rule: provide 90% selfless content, and 10% self-promoting content. Engage. It’s not enough to just follow and tweet good content. You also need to engage with the life science community. It should come naturally, if not you’re not following the right people! Retweet interesting content, reply to twitterers who capture your attention, or just say hi. I think you’ll find that you’ll even make some friends! They don’t call it SOCIAL media for nothing! Think holistically. Most social media applications work best synergistically with other tools. A twitter account works much better if you also have a blog which you can tweet about, for example. Also, it’s a good idea to get to know the twitterers you follow by leaving comments on their blogs. The general theme is, be a part of the community! You’ll find you know more about your field and the world in general by following Twitter. You may not notice it right away, but you’ll be getting ‘Tweet Cred’ and your number of followers will grow. Lighten up. There are many brands, life science and otherwise, on Twitter. The most successful ones show they’re human and tweet some personal information. Regardless of your motives, it’s a good idea for many reasons to show you’re human. For one, it makes the experience more enjoyable. It doesn’t have to be anything unprofessional, it can simply be commenting on the weather, for example. As we’ve pointed out, engaging is key, and nobody wants to interact with a robot! You also may find you share hobbies, etc. with other life science twitterers, allowing you meet those you might otherwise would not have. This list is good to get you going on getting more followers and mastering twitter, and we also offer Twitter training and as part as our Workshop 3: The Rule of 3’s for 3rd Party Applications: Strategies, Tactics, and Metrics. Contact us for more information, and subscribe to our blog so you’ll get this information in your inbox hot off the press. 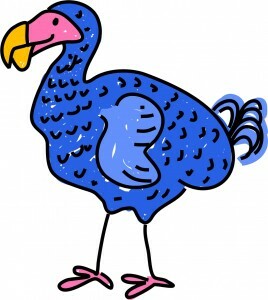 Note: The Twitter ‘mascot’ is a blue bird, so a blue dodo seemed fitting for life science. Get it?